The holidays are creeping by and it will soon be time for school to start again. Of course, this month’s Bostik Blogger theme is Back to School. Biggest is so excited about starting Year 1, but I know the transition and changes will be very difficult for him at first. Last year, when he was starting Reception, we made this visual timetable to help him. 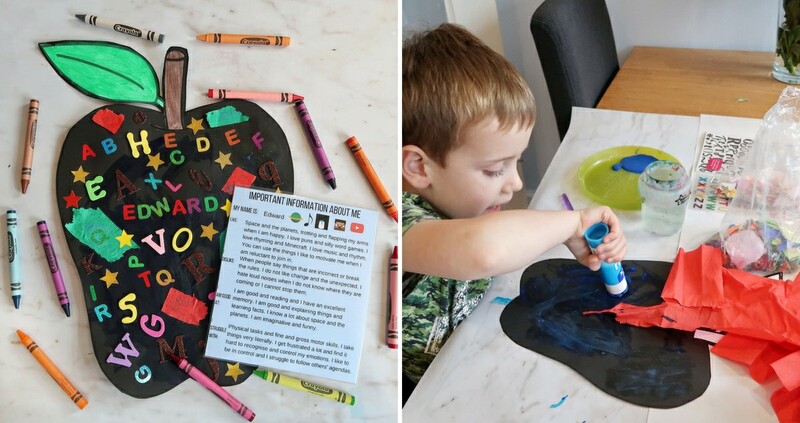 This year’s Back to School Craft is something that children will love. It is also particularly useful for the parents of children with Special Educational Needs. 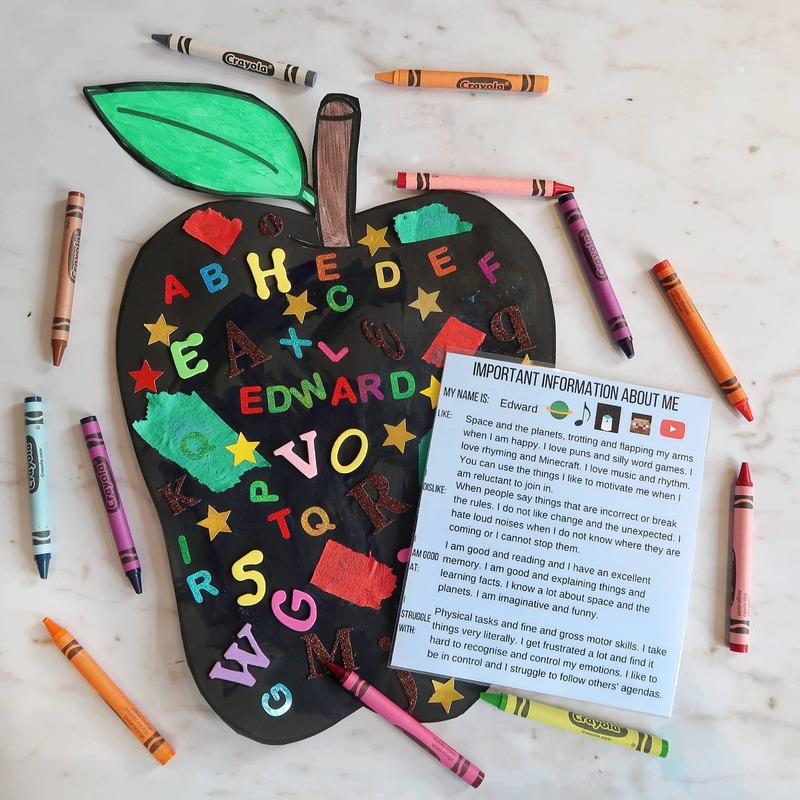 This card is shaped like a blackboard apple, meaning the children can be really creative and practise their spelling when making it. It also has a pouch at the back where parents can place important information about the child. Start your back to school craft by printing out the apple template in the size you would like. We wanted A3 and so we blew it up and printed it out over two pages. I then put the two sheets together and drew around the apple shape onto black card. 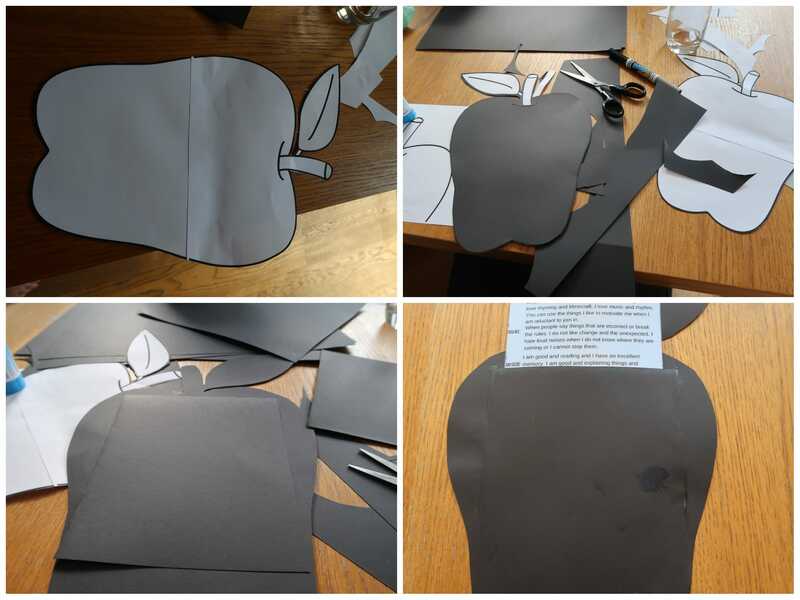 Next, carefully cut around the shape to create an apple ‘blackboard’. I also cut out and glued the stalk and leaf over the card, so that the children could paint them – but this is optional. You could just leave them black. I also glued on an extra flap of card on the back in order to create a place for our ‘All About Me’ card. Once the apple templates were finished, I let the children loose. I provided glue, tissue paper, paints, sticky letters and other objects for them to stick all over their apples. Older children may choose to write a message to their new teacher. Biggest managed to write his name in letter stickers and I helped Littlest write hers. 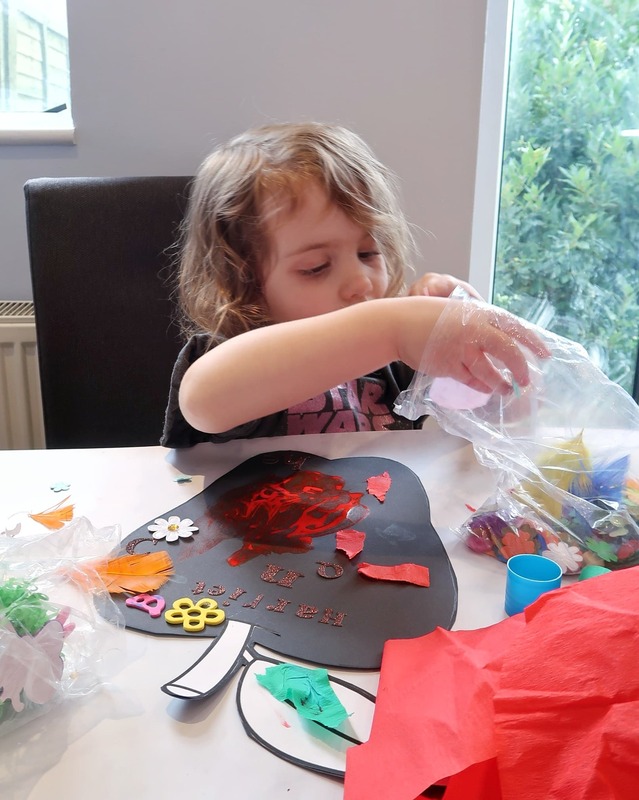 They then just had lots of fun sticking whatever they would like all over their creations! 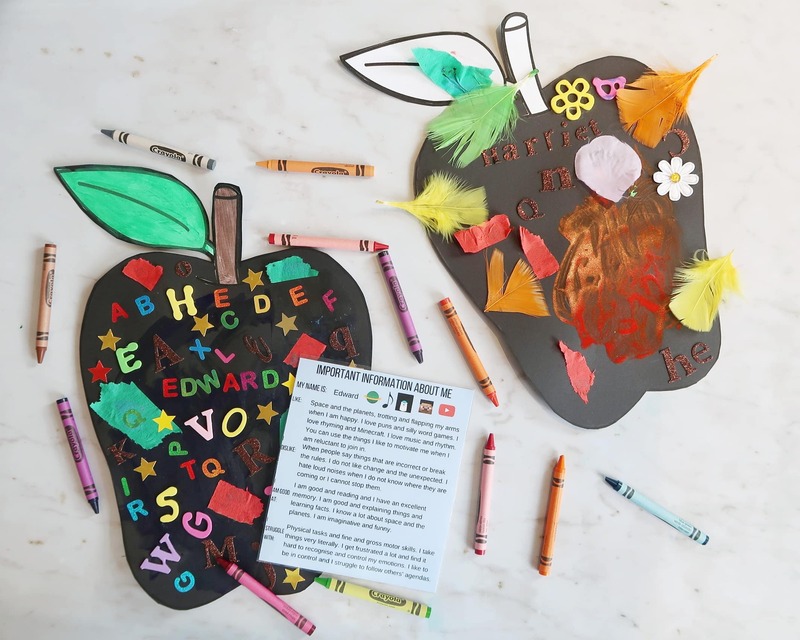 Once the children had created their blackboard apples, I let them dry while I created a laminated card with Biggest’s important info. 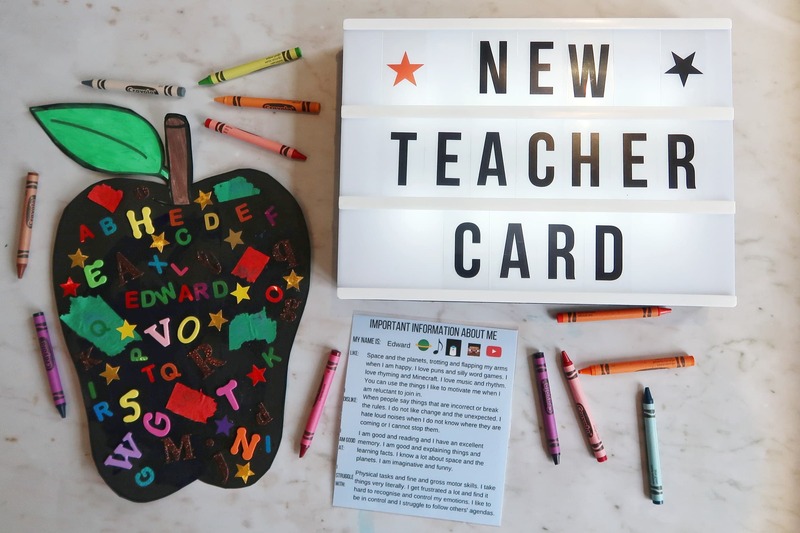 Giving the teacher a card with important information about likes or dislikes is a good tip for parents when their child is starting a new school year. However, for parents of children with special needs, it may be particularly useful. I asked Biggest about the things he likes and dislikes. 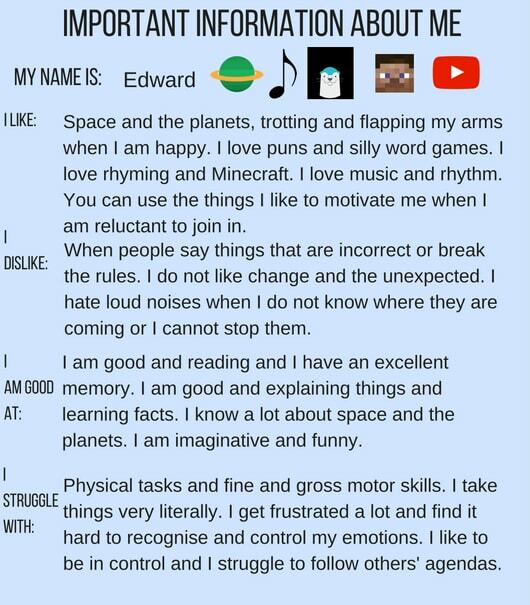 I also though about which key information may be useful to a teacher but which may not be apparent on his EHCP. We then printed out the card, laminated in and put it in the pouch on the back of our back to school craft apple. We used Canva to create our Important Info card, but you could just as easily use a word processor. Our Back to School Craft Card is now ready for Biggest to give to his teacher when he starts in September. Please note, Bostik send a selection of craft items each month. 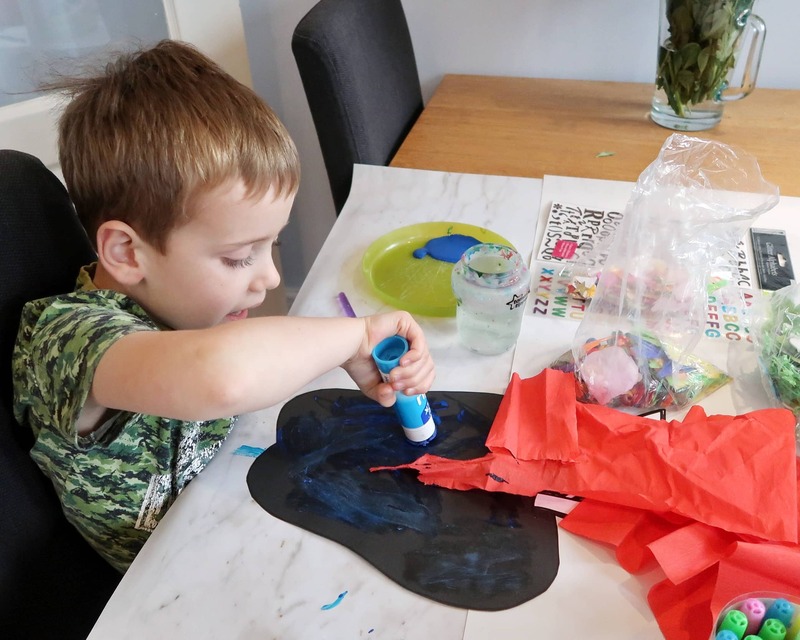 We use these to complete the monthly Bostik Bloggers craft challenge. Some links in this post may be affiliate links. Please see our Disclosure Policy for more information.